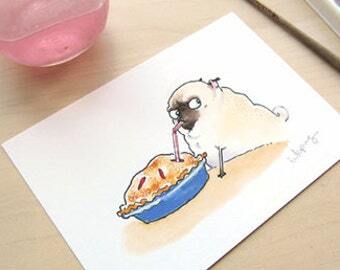 Pug art, pug cards, funny cards, pins and magnets! Our International shipping rates work like this: We charge the cost for an 8+oz package ($17 Canada/$24.50 Int'l) per order. We refund the excess ($7 Canada/ $10 Int'l) for any packages UNDER 8oz, after the order is shipped. Typically, each card & print weighs about half an ounce, and the packaging will weigh 2.5oz. If you'd like to know the weight of a potential purchase in advance, I'll be happy to calculate - just ask! To avoid expensive international shipping costs, we'll be happy to upload artwork to Society6.com upon request! Have a wholesale inquiry? 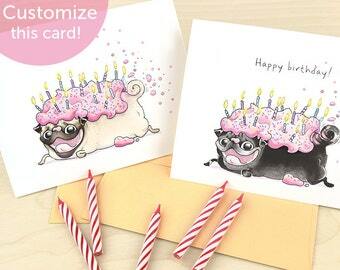 Contact us via inkpug AT gmail.com and I'll put you in touch with our new card wholesaler! Have a question? FAQs here: https://www.inkpug.com/faqs ...and I'm here to answer everything else! 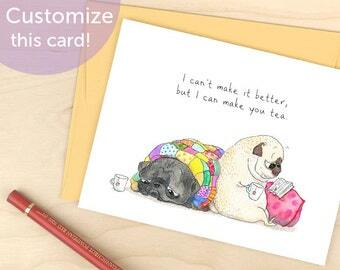 Pug Tea and Sympathy Card - Sad Card, I'm Sorry Card, Pet Loss Card, Pet Sympathy Card, Cute Sympathy Card, I'm Here For You Card by Inkpug! 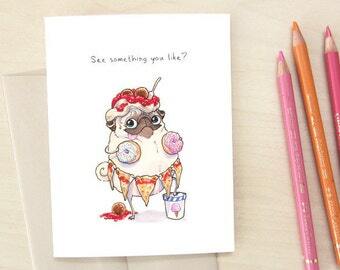 I love this card with the pug wearing sparkly antenna's on his his head! My sister really enjoyed receiving it. Great quality! We love it! Another sparkling clean day in the workshop. My three touchstone liquids: coffee, tea, and paintbrush water. Feelings appear to us as pugs. We draw them. We're Lauren and Gareth! We love coffee, chocolate, and drawing little arts to share. We draw pugs because they're expressive and elastic, emotional and bizarre...a little bit human and a little bit 'It Came From Outer Space'. We hope you enjoy the Inkpugs as much as we enjoy bringing them to life! Everything in this shop (from cards to prints to buttons and everything else) is handmade by us! If you're holding one of our items in your hand, Gareth or I have held it in ours. 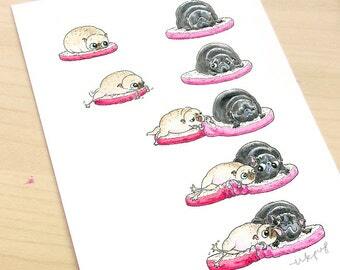 I draw and paint each pug design by hand, then use my three wide-format printers (Big Ed, Norma and Deputy Hawk...RIP Pete Martell, whose print head quit us after 3 wonderful years) to create everything from cards to archival prints in my glamorously tiny home studio! Thanks for visiting us here on Etsy! If you want to keep up with our pug drawings, you can follow us on Facebook, Twitter, Tumblr or Instagram to see new art as we post it! It's just pugs. Mostly pugs. Maybe sometimes not pugs. But mostly pugs. It's mostly snacks. Sometimes it's pugs or cutting paper. But mostly just snacks. Our sticker printer turns our designs into high-quality stickers with gigantic machines that definitely can't fit into our closet. Our publisher prints our books as needed! It's important to us that you receive a great experience and a high-quality handmade item! If you have any issues with your order, please contact us ASAP so we can work to resolve it! As long as your order hasn't shipped, I will be happy to cancel it! Request a cancellation via your orders page or by sending us a message. Once your order has been shipped, it cannot be canceled, but can still be processed as a return. We happily accept returns of non-custom items in new/unused condition! Just send the items back to us within 14 days of receipt, and once we receive them we'll process your refund (minus shipping costs). HOLIDAY ITEMS will be accepted for return until 10 business days prior to the holiday, after which time they are not returnable. ►Customized items & fundraising items are non-refundable, but we will replace these items if they arrive damaged or defective! All of our packages ship with tracking so you can follow their progress online! If you do not receive your package after 14 business days (6 weeks for international orders), please contact us so we can investigate! If your package seems lost, we may file a mail theft/loss report to see if it turns up. If it doesn't, we may ask you to sign an affidavit of loss for our insurers before sending replacement items or processing a full refund. We may add signature confirmation to subsequent mailings to ensure you receive your order. We reserve the right to cancel any order for a full refund. We accept Paypal, credit cards/direct checkout and Etsy gift cards. Orders will be printed & shipped once payment has been processed by Etsy. 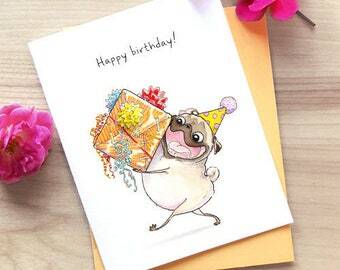 For a holiday or occasion, please order 10 business days (USA), 4 weeks (Canada) or 6 weeks (Int'l) in advance to make sure your pugs will reach you in time! ►After placing your order, PLEASE CHECK THE SHIPPING ADDRESS! We can't replace/refund items delivered to incorrectly-provided addresses, and we can't refund shipping if your item is returned back to us due to an insufficient/incorrect address provided! ►COMBINED SHIPPING: We'll happily combine items to save you money on shipping, but we don't always notice multiple orders! If you have multiple orders you'd like combined, just send us a message before they ship. ►CANADIAN/INT'L SHIPPING COSTS: We charge the cost for an 8+oz package ($17 Canada/$24.50 Int'l) per order. We refund the excess ($7 Canada/ $10 Int'l) for any packages UNDER 8oz, after the order is shipped. Typically, each card & print weighs about half an ounce, and the packaging will weigh 2.5oz. If you'd like to know the weight of a potential purchase in advance, I'll be happy to calculate - just ask! Any questions? 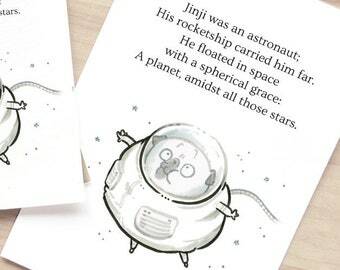 We've got some FAQs here: https://www.inkpug.com/faqs and I try to respond to all convos within 24 hours, so feel free to drop me a line! I, Lauren, am the data-controller of your personal information as it relates to my shop. When you place an order with my shop, Etsy will show me your name, delivery address and email. I use this info only to process/ship your order, or to lookup or answer your questions about the order. I won't share this info unless I'm legally bound to do so (so don't start any evil empires that will send the law to knock on my door). I won't give, sell or otherwise use your info for any other purpose, including mailing lists, 3rd parties, etc., with the exception of allowing the USPS to see your address as printed on shipping labels/packing slips, or if the IRS requires my records for financial audits/verifications. I don't store your data. Etsy stores your data. Insofar as I maintain my shop with Etsy, my shop records on Etsy (for example, old transactions) will remain on Etsy. I also don't have any access nor knowledge of your payment account details (for example your credit cards or Paypal info). Etsy may store this info, but I do not. If you have any questions about what personal data I have stored about you, you have the right to ask and to ask that the data be changed or deleted. You also have the right to complain to the ICO if you believe there is a problem with the way I handle your data.